The KC Regulations Booklet dated 1st January 2014 states that “No person shall carry out punitive correction or harsh handling”. 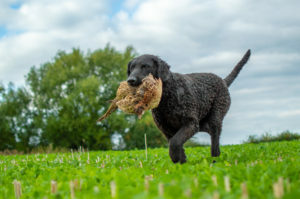 The Curly Coated Retriever Club fully endorses this statement and whoever heads gundog training sessions or any event run under the auspices of the Club has the Club’s authority to deal with this matter and ask the offender to leave the training session. Dated 28 June 2014 and approved in Committee. 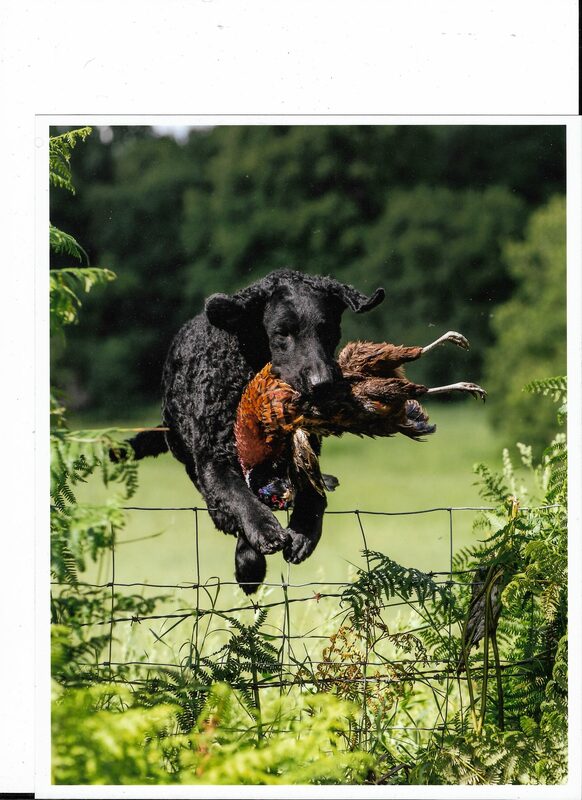 HISTORY In the early history of the Show World all Gundog Champions were required to pass a working qualification. By the 1950s, with the increased popularity of shows, the numbers of potential Champions on the bench were growing and the opportunity and/or necessity to gain a working qualification at Field Trials was declining. Therefore, the title of Show Champion came into being, but to achieve Full Champion status the dog still needed to qualify at a Field Trial either with an award, COM or by passing the Show Gundog Working Certificate. AIM To provide credible proof of the natural working ability of a KC registered Gundog that has already proved it meets the KC Breed Standard by a qualification in the show ring. 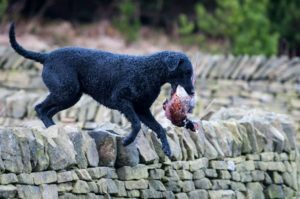 PREPARATION Whilst the Judges on the day are looking for natural working ability, for retrieving breeds it is expected that your dog has had experience of handling freshly shot game, will retrieve from water, and is not afraid of gunfire. It is also important that your dog is under sufficient control to undertake the test once the lead is removed. ETIQUETTE AND CONDUCT There is an established code of conduct expected at Field Trials and this applies equally to Show Gundog Working Certificate Days. Participants should be aware that it is a privilege, and not a right, to be present and to take part, and shall not openly impugn the decision of the Judge or Judges or criticize the host, ground or guns. All Judges, Stewards and other helpers, entrants, supporters and spectators must be courteous to and co-operative with the host and the Steward of the Beat, (who will usually be the Gamekeeper), and should fall in willingly with their arrangements to achieve the best result possible in an atmosphere of friendliness and confidence. It is expected that those attending these events will dress appropriately. While there are no specific dress requirements, it is suggested that clothing worn should be suitable for the shooting field, warm, waterproof and unobtrusive. Brightly coloured clothing should be avoided. The production of game to the guns is not assisted by noise, and those present should conduct themselves quietly and ensure that no unnecessary disturbance is created which might disturb game. AT A FIELD TRIAL The permission of the Society holding the Trial must be obtained and the dog must be entered on the entry form of the meeting. The fee charged by the Society should be the same as that for the dogs entering the Trial. AT A SHOW GUNDOG WORKING DAY These are organized by a number of registered societies in the UK and are run entirely for the purpose of Show Gundogs to achieve the SGWC. In recent years the number of these days has gradually increased along with training days aimed particularly at this Certificate. Any Kennel Club registered Society authorized to hold Field Trials may apply for permission to run a Show Gundog Working Day. A ‘Secretaries Checklist for running a Show Gundog Working Day is available free of charge from the KC Field Trial Department. The dog has been tested in line. The dog has shown that it is not gun-shy. For a Retriever, that it hunted for, and found, dead or wounded game, faced cover, and retrieved tenderly. For a Spaniel, that it hunted, faced cover, produced game and retrieved tenderly. For a Pointer or Setter, that it hunted and pointed game. For a Hunt, Point and Retrieve Breed, that it hunted, pointed game, and retrieved tenderly. For all retrieving breeds, that the dog entered water freely, swam and retrieved (If a natural retrieve from water is not possible, then a dummy may be used. If suitable water is not available the dog is permitted to undertake a special water test on a separate date at a separate location recognized by the issue of a Certificate, to be signed by two Field Trial Panel Judges one of whom must be on the “A” Panel. JUDGES However you decide to attain the Certificate, at a Field Trial or a Show Gundog Working Day, there will always be two Judges assessing the work of your dog at least one of whom will be on the “A” Panel. water element has not been undertaken please note the following paragraph on the “Water Test” in which case the certificate will be held by the Kennel Club until completion of the water element). WATER TEST If suitable water is not available for the retrieving breeds at a Field Trial or Show Gundog Working Day, Show Gundogs will be permitted to undertake a Special Water Test on a separate date and at a separate location. This will be recognized by the issue of a separate Water Certificate, to be signed by two Field Trial Panel Judges, one of whom must be on the “A” Panel and sent to the Kennel Club to be recorded in order that the dog can be given its complete Show Gundog Working Certificate. The term “Champion” [Full Champion] must not be confused with the term “Dual Champion”. A Dual Champion is a dog that has become a Champion in the show ring and a Field Trial Champion, which in recent years has become quite a rare occurrence. However, the acquisition of the Show Gundog Working Certificate does indicate that a qualified dog has retained its working ability with prestigious recognition in the Kennel Club Stud Book. The following dogs have passed the Working Gundog Certificate.